Before there were "GATE" programs in public schools and long before there were kids diagnosed with ADHD and strung out on Ritalin, there were teachers who gave kids extra assignments to keep them busy. I had the benefit of learning from one such teacher. She didn't know it but she gave me one of my best childhood memories when she gave me the assignment to research the building of the Golden Gate Bridge. Growing up in the San Francisco Bay Area and moving to Kentucky as an adult left me with ha special affinity for the bridge. When I get home sick, I think of her. I think of all the times I crossed her and even in my angst over city traffic or how the tolls have increased, I was always mindful of her beauty. I used to love to take people from out of state to see her and hear them say, "It's orange, it's not gold." 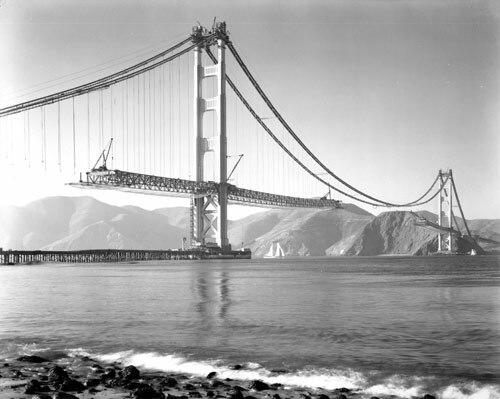 On this, her 75th anniversary, I am fondly remembering the assignment given by my second grade teacher, researching the building of the best bridge in the world. I went home and did the first thing I could think of, I asked my step-mom about it being built. My step-mom had gephyrophobia. 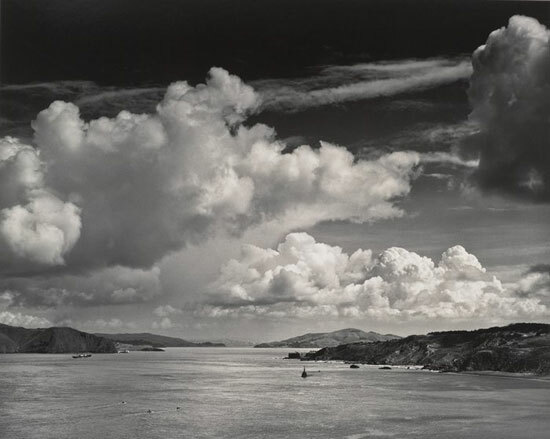 When I asked her about building the Golden Gate she went into a long and terrifying story about the men who were buried in the cement moorings of the Bay Bridge. These unfortunate men fell in while they pouring the foundations and nothing could be done. They couldn't get them out so they kept on pouring. She told me her childhood friend's father was there in the cement and that's why she didn't like bridges. Besides having the scoobies scared out of me, it was pretty obvious that asking her wasn't going to help me get started on my research. I resolved to ask my grandfather. He was the sweetest, kindest person I knew and I could trust him not to scare me with grisly tales of men dying in cement. My grandfather, who was born just after the 1906 earthquake which made him an expert in all things San Francisco, was delighted to tell me all about the building of the Golden Gate. He told me that my great-grandfather had been a bridge builder and helped build the old bridge on the Carquinez Straits. I had hit the mother lode! Funk and Wagnalls step aside and get thee behind me, World Book! I was getting primary history from the expert in all things, my grandpa! He told me all the intricate details and technical aspects and I took note of each one. I could not wait to give my report to the teacher and the class. The next day when the teacher asked those of us who had been given assignments if we had completed them, I nodded and waved my hand in the air so furiously that she called my name first. I stood up in front of the class and gave the following politically incorrect report. Remember, I was a kid during the cold war and we learned to duck and cover. 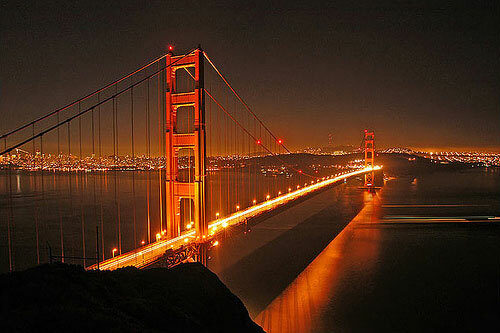 "The Golden Gate Bridge took a couple of years to build. There were some ninnies who didn't want it to be built and so they aren't allowed to use it. They have to drive around the entire San Francisco and San Pablo bays to go north. That's their punishment for not thinking things through. The places where you pay to go across didn't used to be toll booths, they used to be inspection booths to see if you had ninnies in your car. If you were caught with a ninny, you had to turn back. "The bridge is built with many such security features. Most of them were top secret until just recently so not many people know. Those big orange towers? They are built with big cannons in them and the roadway is built so it can be pulled back inside the hills, that way if the stinking Japs come to try and bomb us like they bombed Pearl Harbor, the guy watching from the top tower pushes a button and the cannons come up and the roadway disappears. Between those guns and the Nike missiles on the beach and at the Marin headlands, we'll be safe, but we should probably get under our desks anyway. " I was just getting started when my teacher thanked me and asked the next person to give their report. I was devastated. Looking back at the misadventure as an adult, I imagine Miss Cody had a really difficult time keeping a straight face. I sat at my desk pouting until Miss Cody slid a book on the Golden Gate Bridge in front of me and winked at me. She indicated it would be OK for me to read it while the reports were going on. I started reading and boy was I shocked. It turns out that primary sources, even if they are your grandfather, can be totally unreliable. I began to think about every story my grandfather had ever told me and suddenly they were all ludicrous. Once I asked him why dogs always smell each other's behinds and he told me there had been a windstorm that had blown so hard all the dogs back ends were blown right off and God had to put them back on so quickly they got mixed up. That's why dogs sniff each other, to make sure they had the right backside. How could I have been so naive?? Eventually my anger and distrust gave way to fascination over his imagination. It was always a tricky thing, trying to determine truth from fabricated embellishments and downright lies of the most entertaining kind. Today I am missing the Golden Gate and Grandpa. Both born in May and both have had a hand in shaping my adventures.